This is the fifth Online Guest Lecture by members of the SCID Panel of Experts. 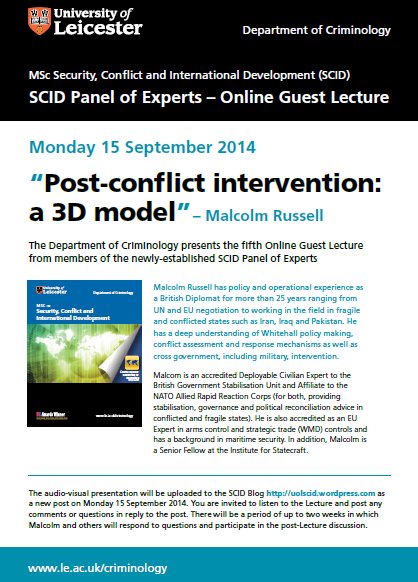 Malcolm Russell presents a lecture entitled ‘Post-conflict intervention: a 3D model’. Click on the link below to access Malcolm’s Lecture (it is large so it will take a while to download). Please submit any questions or comments within the next two weeks for Malcolm’s attention and/or discussion by other SCID Panel members, students and staff. This entry was posted in Uncategorized on September 15, 2014 by uolscid. First of all let me congratulate Malcom Russel for this outstanding lecture! I just have a little comment to make. I believe that post conflict intervention is a duty more than anything but this duty has to be adapted to local reality! Post conflict intervention aims to foster post conflict stabilization and recovery. Besides what makes a successful transition is national ownership of post conflict recovery with the support of intervening foreign actors (NGOs, states and IOs). Without national ownership things just go in the wrong direction. A very good introduction to the topic. Due to its complexity I feel to be in a too early stage to comment deeply about it. A multifaceted issue varying every time from an historical and geopolitic perspective. Many sub-topic to be deeply cleared before understanding if, and when, the stabilization has success and if it is really in the interest of the taxpayers or the country emerging from a conflict. I have listened to Mr. Russell’s lecture; he really displayed the depth of knowledge, through the lectures and the examples he used to demonstrate. I would like to mention that the topic (Stabilization) is wide, with so many splinters and defies, Mr. Russell indicated these clearly, when he mentioned the 3D could be seen or become 3C at (unknown) stage of stabilization. The stabilization weigh is different from situation to another. Mr. Russell mentioned, “Intra-state intervention more accepted” “during the last ten years” “the examples are Iraq and Afghanistan” as well as other forms of intervention. I believe these are the most controversial issue especially in Iraq, where it could change the intervention (which supposed to contribute for stabilization) to invasion. As you know, Obama’s administration opposed the previous Bush’s administration and how could be given an example of stabilization, these countries have been rated among the most corrupted countries as the global classification with no stabilization could be observed even after eleven years already passed. Bush’s administration were not be able to obtain the Security Council approval to initiate the war on Iraq in spite of all attempts, only after the collapse of the regime and the Iraqi’s government systems then the Security Council, issued the UN resolution and called the US role as occupying authority. I can say that the Sadam’s Regime is the most controversial issue among others in the world with tremendous debate, where he (Sadam) challenged the international community. My point here, I believe that the situation in Iraq and the following consequences could contribute to thorough review with terms of interventions or abstain to preserve peace and security. The 3D could be used as a baseline for further means of stabilization either to add Ds or ABCs during the stabilization process, in a country\ies emerging from war, or during the wartime as a mechanism for peace. I would like to thank Ambassador Russell for sharing his expertise and allowing us to query his position. It is indeed an honour. Before raising my question, I would very much like to apologise if I failed to comprehend any key elements of the presentation. Sadly, learning sometimes requires openly sharing one’s lack of understanding in order to obtain new information. So…into the breach I go…and, again, apologies for my flailing and gratitude for any perspective you might lend me. I fundamentally, and indeed ethically, agree with the tenet that indigenously owned and co-opted stabilisation, predicated on local conditions and the maintenance of sovereignty, will improve the odds for long term peace in most post-conflict regions. However, I remain concerned/confused that if we truly avoid exercising the 3Cs in certain theatres (indeed some of which unequivocally demand the absence of such) any resultant stability we foster might only extend to the region in question for a short duration – and possibly fail to address ideologically derived “far-enemy” warfare propagated by non-state actors who find sustenance – as well as the ability to thrive – in other people’s crises. Especially, if asymmetrical tactics prove beneficial and political momentum is gained by such activities. (This question purposefully omits reference to near-enemy fundamentalist activities as evidenced in Syria and Iraq at the present time). To clarify, I seek feedback, regarding the notion that far-enemy agendas could be propagated from areas remote to the destabilised/stabilising region, which could then act to destabilise additional regions. An unintended cascade effect, occurring in the absence of Control, one of the 3Cs. And, more importantly, how do we work around the opportunistic agendas of outside influences in the absence of the 3Cs if those outside influences find fertile ground in precarious arenas and their activities fall outside the scope of 3D interactions? Following its conflict with Russia, Afghanistan only became stable once the Taliban asserted dominance and control. While the security offered by the Taliban was riddled with structural violence (an American attempt at British understatement if ever there was one), and occurred in the absence of international involvement (the concurrent absence of the 3-Cs ), the “structure” which emerged derived from local values, focused on local concerns, and was wholly owned by local leadership. Indeed many reports from the nation suggested the newly instituted security was a welcome change for people on the ground – and therefore held a degree of international legitimacy. By my limited understanding, the absence of both the 3Ds and the 3Cs allowed this form of security to become instituted and the resultant environment fostered the second generation Jihadists which included the founding members of Al Qaeda. Would a post-conflict zone such as Afghanistan in the late 80’s/early 90s have actually welcomed and/or adopted the objectives associated with the 3D’s? Even in the absence of any or all of the 3C’s? This was, to my understanding, a time when the key actors were first-hand witnesses to the blacker arts of warfare crippling a super power. Additionally, the prior decade saw neighbouring Iran institute an “Islamic” state over and above pre-existing social, economic, and diplomatic interdependencies with the west. Shedding western constructs and re-creating one’s native preference seemed distinctly possible – and fertilized the ground for greater instability both locally and abroad. While I am by no means a proponent of “security at all costs”, I remain bewildered how we address this dynamic. And hold additional concerns this dynamic might be festering in the North of and Horn of Africa. Thank you all for your kind and informed comments. There are many perspectives that could fall within the concept of stabilisation. One of the aims of the lecture and my research generally, is to try to identify these various strands and assess how they impact on the community where they are undertaken in terms of longer term conflict management. In my view, there is a need to identify those aspects of an intervention which facilitate the management of conflict through political, social and cultural mediation. In my opinion, this is the essence of stabilisation. There is certainly a role for military force to stop violent conflict and, in the early days of a post-armed conflict intervention, to maintain the cessation of violence. But force will, at best, suppress violence not address its drivers. An intervener’s stabilisation activities, in my view, also should not attempt to address the drivers of conflict directly but facilitate the development of local political, social and community processes that are responsive to and reflective of, local conditions and circumstances through which conflict can be managed by non-violent means. My lecture suggests that well-meaning intervention, even of the most integrated 3D models, can sometimes overlook this fact and try to solve the conflict directly using models that have worked for what are perceived to be similar circumstances elsewhere and based on their own world view of how outcomes should be structured. The problem with this approach is that the goals against which success are measured are based on the intervener’s view of what success looks like and ‘progress’ is measured and rewarded against these landmarks. Therefore, locally developed processes of conflict management are not developed and the participants to conflict in the local region are left with trying to accommodate, manage and even resolve conflict using inappropriate tools that do not allow grievances and differing views to be developed, expressed and explored. At a policy level for the intervener there is, however, a dilemma because if they do allow locally reflexive processes to develop into national systems, the state may not develop in the direction and form that is in its own interests (for example, may not have the same values structure). Picking up on the point made by mistarihi, the Iraq intervention is a good case study. Indeed, I did so in a paper which you may wish to glance through. It is called Liberal Democracy Promotion in Iraq: A Model for the Middle East and North Africa? Jeff Bridoux and Malcolm Russell Foreign Policy Analysis Volume 9, Issue 3, Article first published online: 3 JUL 2012. It is available via the University on-line library. This paper’s focus is the promotion of democracy, but it identifies also that there was no clear ‘stabilisation’ process in Iraq. Instead, there was a continuation of military activity against a perceived enemy. Thus the intervention was, as mistarihi analyses, the use of military force to overthrow a regime and the continuation of military force against those opposed to the international presence (and who wanted to shape and build Iraq in their way). The landmarks that determined ‘progress’ were set against the backdrop of the intervener’s interests and values, and they were achieved through the construction of the institutions of Western democratic process: Parliament was built and established, political parties established, voting undertaken. This western model of democratic process at the institutional level ticked the boxes for the declaration of ‘success’. But beneath the surface, the social and community transition required to operate a system of democratic process was absent: this is due to the lack of what I would identify as ‘stabilisation’ through which conflict is managed away from violence and towards political, social and community processes in forms of reconciliation, recognition of the rule of law, and forms of expression that allow overlapping and opposing views to be developed. Democracy is not an imposed system, in my view, but one that develops from the inclusions that stabilisation should promote. Since 2004 some forms of transition have occurred at the community level in Iraq but they are not consistent with the Western model of democratic process that was grafted on to central political processes in Iraq and, because no political space was provided for this type of locally developed process to emerge, there is no means through which they can be expressed. In the meantime, traditional sectarian elite used these newly imposed processes to not only gain power but also use the veneer of legitimacy that democratic process brings to translate this power into a claim of democratic authority but which, in fact, is based on sectarian divide. Therefore, community transition (bottom-up) was stifled and existing elites adopted the political doctrine of Western democratic institutions (top-down) to reinforce their own sectarian interests. This is one of the continuing drivers for sectarian strife in Iraq and it could also be seen (more broadly, not just as a result of what happened in Iraq) as one of the factors that has facilitated the rise of the claims to an Islamic State. The process of stabilisation should, in my view, start as soon as violent conflict has been sufficiently reduced to allow dialogue. In Iraq, with the tight political time frame of less than a year to ‘introduce democracy’ the focus was less on sub-national political, community and social reconciliation than on building a Western style of government. The key message, therefore, for me is that there needs to be a clear distinction in understanding of what the various strands of an intervention of this sort comprise. This is complicated because they all need to be undertaken across a similar time frame within an intervention of this sort and some of the desired outcomes are conflicting, but it is crucial to understand and balance effectively the various activities and ensure that the longer term stabilisation processes are allowed to develop. Going back to the lecture, for example, the military phase of an intervention is to physically stop violent conflict: defeating an enemy, reducing their ability to fight. Stabilisation, in my view, is to facilitate the means for local participants, in particular those who are involved in the violence, to develop locally acceptable processes of conflict management. These strands of activity, and all those others within the 3D model, need to be balanced and space provided for the more nuanced approach of stabilisation to be facilitated through which locally developed and inclusive community, social and political processes can gradually emerge in which reconciliation of conflicting views can be managed. In my view, an intervener cannot hope to solve the drivers for conflict but to facilitate and encourage the processes for local participants to be able to manage them without violence. ‘far-enemy agendas could be propagated from areas remote to the destabilised/stabilising region, which could then act to destabilise additional regions. An unintended cascade effect, occurring in the absence of Control, one of the 3Cs. And, more importantly, how do we work around the opportunistic agendas of outside influences in the absence of the 3Cs if those outside influences find fertile ground in precarious arenas and their activities fall outside the scope of 3D interactions? I think one of the key concepts here is to distinguish between Control and Authority. There is insufficient space to expand in detailed argument which the question deserves, but in brief perhaps I can reflect by postulating that within each state, based on the Westphalian model, if there is consent, power and control translates into authority for the use of force on behalf of the state. If this is accepted as a premise, the consequent condition to examine is that of consent. If consent is limited to a particular group, authority may be seen by those not in that group to have become control. The difference is quite fundamental to those whose consent is absent because, from their perspective, the state authorities are no longer exercising authority on their behalf to maintain order, but using power to exercise control over them with few means for them to challenge this power. They therefore feel excluded from political, social and community processes through which they can express and/or promote their points of view with any likelihood of having them responded to. Far-enemy agendas that rely on destabilisation exploit these structural weaknesses and use them to gain traction within communities. Many Western states recognise this as a weakness within their societies and have set up counter-radicalisation policies that seek to address that some members of society feel isolated, disaffected and not represented. Therefore, I would argue, if such states are taking these steps at home, why would they not seek to do so in their interventions in other states? Exercising control over the state in which an intervention takes place does the opposite. It creates control based on power rather than seeking to develop authority based on broad consent of all participants in an area of conflict. The more broadly based the consent, and therefore the more that rule of law is based on authority rather than power, the less likely it will be that outside influences (eg from far-enemy strategies) will be able to gain traction. I am not advocating giving up the use of force or the exercise of control in some cases and in some circumstances. Evidentially, doing so will not work. My suggestion is that much more than force, power and control is needed to avoid the recurrence of violent conflict. A major factor in achieving this is a long term process of facilitating the emergence of political, social and community systems through which conflict can be managed in non-violent ways and the acceptance within communities of methods to reconcile differences. This means that all parties to conflict must be prepared to look beyond the specifics of their point of view on individual issues to the coherence and well-being of the entire community so that they can accept the outcome of such processes of reconciliation even if they do not go their way. To do that they need to be confident of their inclusion and participation in, and give their consent to, these processes of mediation. They must, therefore, all be part of the process of establishing these systems of conflict mediation. Indeed, in my view, this is the basis of the social transition towards democracy from a bottom-up perspective, that was lacking in Iraq. The intervener cannot, therefore, establish these processes, or set their parameters. But the intervener can, as a distinct process within a range of other activities (such as the 3Ds) facilitate the gradual process that brings the parties together and establishes the agendas on which such processes can be developed. This, to my mind, is stabilisation. I hope this goes some way to responding to the insightful and thoughtful comments that my lecture has promoted and perhaps gives food for further commentary. It is a developing subject and one which I know the University is keen to explore further through a Stabilisation Adviser Professional Development Course that is planned to be held in May 2015. I would like to thank you for the informative presentation. It’s an added value to my understanding of the subject, especially the way you have explained the 3D model. Do you think this 3D model can be implemented in any given situation/conflict? If I choose the Palestine-Israel conflict, who do you think would be the “enemy” to defeat? To negotiate with? And do you think it’s really possible to end this historical conflict? Lastly, could you please explain the reasons why no such interventions have been implemented in this conflict? Although, as many argued, war crimes have been committed against civilians, in addition to the violated human rights. Thanks for your concise and insightful question. You are right that identifying an ‘enemy’ to defeat is wholly subjective. It is one of the fundamental tensions between reconciliation and the use of force to protect human security and one of the reasons why the use of force should be undertaken with such care. Indeed, is there not already enough use of force in the particular conflict to which you refer? The enemy to defeat, in my view, is the violence. States traditionally use the 3D approach when intervening in any conflict situation. In summary, they will use diplomatic channels to form alliances and seek dialogue where they feel it is possible; they will look to the use of Defence/Military assets where they believe it is legally and morally right to do so; and they will use Development as the means to help recovery and build institutions that will make it less likely that violent conflict will recur. They do this from the perspective of their own state because such interventions are seen as part of their foreign and security policies and are devised to be consistent with other policies that promote and protect their interests. Perhaps one reason why state intervention in this particular conflict is seen to be so difficult is that in taking this type of approach there is perceived to be an alignment with one side or the other, and therefore no intervention can be seen as neutral or representative of what the people on both sides of the conflict really want. Therefore would any international state intervention in this dispute be helpful? Clearly, I cannot answer precisely why states have decided not to intervene militarily, but perhaps my argument above is part of the explanation. As to whether the conflict will ever be solved, I wonder whether the answer lies in the first paragraph of this response. Both sides to the conflict have resorted to extreme violence and all that it has achieved is destruction and death. Violence is the enemy and it needs to be the participants to this conflict that realise this and find the means to transition from expressing conflict through violence into expressing conflict through political, social and community processes. It is the fundamental process of stabilisation: moving conflict from violence to peaceful processes through systems that both sides construct, operate and believe to be legitimate in providing solutions. There needs to be political will on both sides to do this. It is not something that can be brought in or enforced by military intervention from the outside. The parties to the conflict need to want violence to end and build the structures through which the conflict can be managed in alternative ways. I hope that his goes some way to responding to your thoughtful and pertinent question. Thank you Mr. Russel for your insightful response, I do agree that in most conflict situations, violence would be the enemy to defeat. I’m personally against the use of violence in any given situation. However, don’t you think this conflict in particular is a ‘strong vs. weak’ situation? Gazza strip has been placed under military siege by the Israeli forces since 2007, blockaded by land, sea, and air. They have been suffering from an extreme lack of human rights and basic living needs (Water and Electricity) and they have been surviving on the international aid. In regards to your comment about, how both parties were using extreme violence against civilians. It’s been discussed so many times, that the IDF used extreme violence against civilians in Gazza and killed more than a thousand between children and women. While no reports have showed any losses within Israeli civilians, especially during the recent conflict. Illegal weapons have been used by IDF, yet nobody turned to this matter, as well as the disrespected agreement/decision made about ceasing fire. I’m just trying to learn and understand the different natures of conflict, and I kind of gained some understanding about the majority of them, yet I could never understand the nature of international interventions in this particular conflict. I would like to the Mr Malcolm Russell profusely for his precise and informative presentation. However, having taken a close look at the 3D Model, I think the issue of Transitional Justice is not adequately addressed, as it is important to note that there is no thorough stabilisation/peace without justice i.e. those who bear the greatest the greatest responsibility must be brought to justice in order to put an end to impunity. How then can stability be achieved without justice? Also, in the DEFENCE component of the stabilisation process, the “Rule of Might” is emphasised as opposed to the “Rule of Law” by protection against violence, and use of stronger military capacity in order to defeat the enemy. How can the rule of law be effectively maintained during the use of military might? Finally, what is the role of Civil society in the entire stabilisation process taking into consideration the relevance of local ownership? I would like to thank Mr Malcolm Russell profusely for his precise and informative presentation. However, having taken a close look at the 3D Model, I think the issue of Transitional Justice is not adequately addressed, as it is important to note that there is no thorough stabilisation/peace without justice i.e. those who bear the greatest the greatest responsibility must be brought to justice in order to put an end to impunity. How then can stability be achieved without justice? Thank you Mr Russel for this extremely interesting lecture. I will definitely have to listen to it again in order to grasp the whole complexity but I wanted to ask you here a couple of questions. Are there examples of stabilisation processes that have come to an end? What is that makes a stabilisation phase come to an end, and is there a post stabilisation phase? When I look at the example I know best, The Great Lakes region and the Democratic Republic of Congo in particular, it seems that stabilisation efforts have been going on for decades and yet the conflict (called by many a low level conflict) is still there. If I try to apply the 3D model to the DRC, I have the impression that the tensions between the 3 Ds are very strong and that there is very little coordination between the different actors in order to end conflict and focus on reconstruction and development. You clearly speak about these tensions in your lecture and the danger that good developments in one of the areas could result in worsening of the situation in another area. In DRC these tensions are contributing to create something like two Congos with (sometimes too weak) Diplomacy activities in Kinshasa and Defense and Development activities in the Kivus that so far have not really contributed to end violence and increase the quality of life of people. Has this to do maybe with the fact that there are too many actors involved in stabilisation in DRC and too little coordination among them? You catch me as I am about to deploy as an Adviser on a military Exercise for two weeks so time is pressing. From one perspective, stabilisation is a continuing process which manifests itself in society in different ways. In the early period post armed conflict, the intervening state can provide the catalyst and encourage this process. Gradually, the state recovering from armed conflict should, if stabilisation intervention has been successful, continue these same processes without the catalytic support from an intervening state. What tends to go wrong is that the intervening state seeks to provide the solutions (from its perspective) to address conflict rather than facilitate the development of locally structured and contextualised processes that manage conflict away from violence and into political, social and community engagement. An intervening state is likely to set the condition for the solutions that it assesses to be needed on its world view. That is, how it sees the international security architecture, its own values and from the perspective of its own interests. The intervening states 3Ds (Defence, Diplomacy and Development) policies are based on these precepts. They are likely to be very different from what is seen as appropriate and important by the local population, and it is quite likely that true root drivers of conflict will not be addressed. Instead, these drivers are often suppressed through the use of force or a veneer of democratic process is adopted by a ruling elite that essentially sidelines the relevant issues. Physical violence becomes structural violence. Power is exercised in ways that Steven Lukes describes as Hidden Faces (Lukes S ‘Power A Radical View’ Palgrave 2004). I hope this helps. I am pressed for time right now and a full exploration of the DRC situation would require extensive correspondence. Perhaps this is something that could be picked up another time. The question you pose move us away from the topic of stabilisation and into the realms of a very complex and sensitive socio-political debate which is beyond the realm of this lecture and follow-up questions to address. I think the issues you are considering in your second post relate to violent conflict between two states whereas the concept of stabilisation as described in my lecture is an activity WITHIN a state where armed conflict has been underway. My 3D model and the role of stabilisation is therefore not DIRECTLY applicable to the circumstances you describe, but there are elements of it that could be. Within a single state that is recovering from armed conflict the processes of stabilisation help facilitate the mechanisms to channel conflict into non-violent processes. The same principle can apply in the situation where two states are engaged in violent conflict, but there are a number of key differences, including the treating of states as unitary actors and the building of trust. But the key point between two states is the negotiation of cessation of hostilities and, thereafter, the process of using internationally agreed processes to settle differences without return to violence. I hope this helps. I am under pressure of time at the moment, and the subject you raise is extensive, complex and sensitive. It deserves a lot more consideration than I have been able to give in this response, which is limited to the relationship with the stabilisation concept of my lecture.